Objective: To determine the probability of weaning from parenteral nutrition (PN) based on intestinal length in neonates with short bowel syndrome amidst the new era of hepatoprotective strategies and multidisciplinary management. Patients or Other Participants: Neonates with ≤100cm small intestine at ≤30 days corrected gestational age, diagnosed with a surgical gastrointestinal disease and PN-dependent for ≥2 weeks from 2003-2012. Patients who underwent a bowel lengthening procedure were excluded. Main Outcome Measure(s): The probability of weaning from PN without re-initiation for ≥1 year, as determined by logistic regression. Results: Fifty-five patients with median(IQR) gestational age 29(26,35)weeks, birth weight 1215(860,2443)g, and small intestinal length 45(21,65)cm were analyzed. Of these, 78% received a fish oil-based lipid emulsion (1g/kg/day), 38(69%) were weaned, 6(11%) remained PN-dependent, 5(9%) were transplanted, and 6(11%) died. Excluding transplanted and deceased patients, the median small intestinal length in weaned patients was 56(35,75)cm compared to 21(6,35)cm in PN-dependent patients (P=0.008), with 86% of patients weaned by study end (Figure 1a). 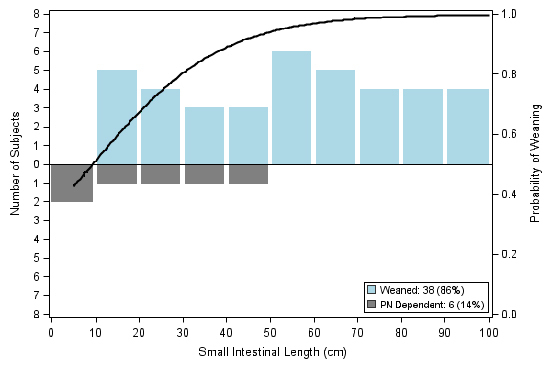 The cumulative probability of wean for patients with <50cm small intestine was 50% by 28.3months and 75% by 55.1months while for patients with ≥50cm small intestine, 50% weaned within 4.6months and 75% by 7.2months (Figure 1b). Conclusions: The majority of patients will wean from PN despite short intestinal length likely as a result of new management strategies in combination with a multidisciplinary team approach. Figure 1. (a) The predicted probability of PN wean according to small intestinal length (N=44). (b) The cumulative probability of wean according to PN duration (N=44). Patients who underwent transplantation (N=5) and those who died (N=6) were excluded.